Villa Pino is a pleasant 3 bedroom property that is located 5 minutes' walk from Waikiki Beach, shops, bars and restaurants. The spectacular sand dunes and breathtaking beach of Grandes Playas are both less than 10 minutes' drive away. The house is a great choice for those not wanting to drive on their holiday. This contemporary villa is tastefully decorated throughout and has a private pool, which is ideal for chilling out. Pool heating, WiFi and air conditioning/heating in the bedrooms are included. The villa is in unbeatable location, plus it has a private swimming pool and contemporary interiors. You couldn't ask for more! The outside area is spacious and has a private pool and a sunbathing area. There is a shaded terrace with a dining area to enjoy the alfresco dining experience with the brick built BBQ, that overlooks the private swimming pool. There are also games tables for everyone to enjoy. There is on-road parking for your hire car. The gates open to the pool area and the front door is at the side of the villa. The front door opens into a hallway with the well-equipped kitchen on the left, which has light coloured units and stainless steel appliances as well as an archway leading to the separate utility room. The open plan lounge/dining area is bright and spacious. It's a fantastic place to relax after a day in the sun as you'll have comfortable seating, a flat screen TV and patio doors overlooking the pool area. There is also a dining table and chairs. All 3 bedrooms - a double and 2 twins - are spread over 2 floors. There is a twin bedroom with an en suite shower room on the ground floor. The remaining 2 bedrooms are located on the first floor and both share the facilities of the separate bathroom. Both bedrooms also have access to the shared terrace and the double bedroom has a private terrace too. Villa Pino is in a great central location. The shops, bars and restaurants of Corralejo are virtually on your doorstep. The sandy beach of Waikiki is 5 minutes on foot and Galera Beach is 5 minutes' further. Only a 10 minute drive takes you to the spectacular sandy beach of Grandes Playas and the amazing Corralejo Sand Dunes. You can even take a ferry from the harbour to the neighbouring island of Lanzarote and visit Europe's first underwater museum in Playa Blanca. Villa Pino is semi-detached with Villa Juliana and our Villas Nanda, Jenny, Sirena and Ola are nearby. The shops and restaurants are virtually on your doorstep. The 2 main shopping centres - Las Palmeras and El Camapanario - have high street fashion, designer shops and cafes. On Tuesdays and Fridays there is a local market in Corralejo. The bars and restaurants are just a stone's throw away from Villa Pino with a large selection to cater for everyone's taste, from traditional Canarian cuisine to Chinese and Indian restaurants. Enjoy lunch at one of the tapas bars, which have typical local food from the island. At Corralejo Harbour you will find good quality local restaurants. The closest beach to the villa is Waikiki Beach in the centre of Corralejo, 5 minutes' walk away, and Galera Beach is 5 minutes further. The stunning beach of Grandes Playas , which is famous amongst windsurfers, is 10 minutes' drive away. Acua Waterpark in Corralejo offers a variety of water slides and tubes or you may choose to venture into the wave pool or the lazy river. Alternatively, you can visit the neighbouring island of Lobos and do some snorkelling while out there. Fuerteventura's former capital, Betancuria, lies in a picturesque valley next to a dried-up stream, which flowed up until the 16th century. Here, the Centro Insular de Artesania, next to the museum, documents traditional arts and crafts - if you want to see some local handicraft this is the place to come! The Mirador de Lobos Golf Resort in Corralejo is 10 minutes' drive away from Villa Pino. Alternatively, there are other golf courses in Caleta de Fuste located on the East Coast just after the airport. Kites are available in many shops in Corralejo. The expansive sand dunes and golden beaches are perfect for kite flying. Alternatively, you can visit Oasis Park and explore the variety of wildlife, or go on an off-road safari along Fuerteventura's Northern Coast. 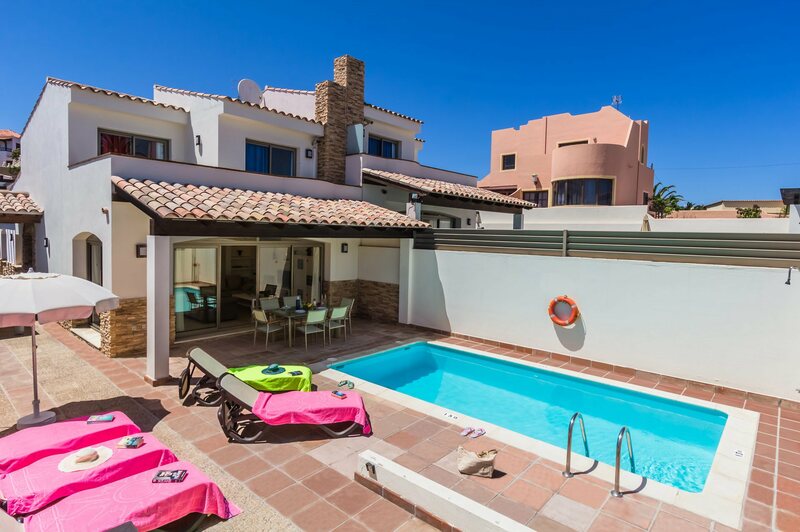 Take a look here at the Fuerteventura villas that are currently on sale. Villa Pino is not available to book for season as it is sold out. Take a look here at the Fuerteventura villas that are currently on sale. One of the main attractions in Fuerteventura is the fairly constant, year-round temperature of the water. The Canaries stream is responsible for the fairly constant sea temperature, and this results in an abundance of sea life, that makes diving such a pleasure. There are about a dozen dive centers, such as Abyss divers in Corralejo, around the coast of Fuerteventura. They all run courses for divers with various levels of ability, and a day spent taking part on a taster course makes for a very enjoyable day out. You are guaranteed to see a wide range of species. The small island of Lobos is around 1 mile north of Fuerteventura and can be reached by boat from the port. The island is an uninhabited nature reserve, but does have a fantastic beach with shallow crystal clear water, perfect for bathing and snorkelling, with plenty of underwater life to be seen! There is also a small restaurant and a lighthouse. Acua Waterpark (formally known as Baku Park) in Corralejo offers a variety of water slides and tubes, water jets and fountains, a selection of pools and lakes both shallow and deep, a wave machine, a jacuzzi, water rings, floats and water games. There is also a crazy golf course and bowling alley. The park is open throughout the summer season from April to October each year and is a great family day out! Bowling alleys available at the Acua Waterpark, also at Papagayo complex, Corralejo, open in the evenings only. Recommeded at the Atlantico Centre, Caleta de Fuste. Open every day and evening. The Corralejo Golf Course was officially opened on the 8th June 2009. This 9-hole course is set on high ground towards the outskirts of Corralejo town, next to the Bahia Azul resort villas and ‘Mirador de Lobos Golf’. There are plenty of challenges to be encountered over its 673 metres, even for the more accomplished golfer, with three holes affected by water and others require very accurate hitting from tee to green. With views both to the sea and the dunes of the Parque Natural, and boasting its own fresh-water lake, this well-maintained course is designed to provide pleasure for both the novice and seasoned player alike. The perfect place to spend a couple of hours on a round of golf, or just to become familiar with the game and meet new friends. Kites are available in many shops in Corralejo. The expansive sand dunes and golden beaches are perfect for kite flying. The International Kite Festival is held on the second weekend of November for 3 days and has been an annual tradition since 1987. People come from all over the world to take part in the event and admire the average 240 kites on display. Granja Tara, next to the windmill at El Roque, near El Cotillo, is a horse rescue centre offering excursions and riding lessons for all levels from beginners to experts and is open all year round. Gran Karting Fuerteventura can be found on the outskirts of Puerto Del Rosario on the east coast of the island. The track is open every day and the facilities cater for all ages. The centre also has a restaurant/bar and a sun terrace with views over the sea and the 1km track. The Sandman is located on the main beach in Caleta de Fuste, 28 miles south of Corralejo. You can book lessons directly with the Sandman on the beach and try your hand at creating your own sand sculptures. The Oasis Park Zoo, located south of the island in La Lajita, is about 1hr30mins from Corralejo by car, or there is a free bus service, and is well worth a visit - great for a family day out! The zoo has a variety of animals, animal shows, a childrens' play area and a super gift shop as well the Botanical Gardens. A wide selection of restaurants and snack bars are also available. Camel safari rides, interactive animal sessions and even a large enclosure with free flying birds are sure to be a hit with all ages. This villa is clean and modern and is ideal as it is 200 metres from restaurants and 400 metres from the beach, but is in a quiet residential area. Absolutley Superb the best villa we have stopped in, perfect villa, perfect position for the beach. Ee will be booking again next year, a big thank you to Villa Plus. Great, loved the overall experience. Stunning, just don't tell everyone we want to go back and we can't if you book it! First time using Villa Plus and would definately use them again and recommend to friends and family. Had a great holiday and the service from Villa Plus was outstanding from booking holiday all the way through to returning home from a great holiday in Fuertventura. Beautiful villa in great location- would definitely come back again and would use Villa Plus in the future! This was our first villa holiday and we were sceptical due to the low price, however everything about our stay was first class. I can't recommend Villa Plua enough, absolutely 5 Star service from start to finish. Can't wait to book again! Villa Pino was fabulous, always book with Villa Plus and this was the best villa we have stayed in to date!